As a prelude, we are going to look into the history of what is called one of the most spread platforms for smartphones - Series60, or simply the S60. By a platform here we mean a software shell including system tools, operating system and a set of user-applications. As a rule all Nokia-branded products, running on the same platform edition, retain similar hardware specifications (CPU type, frequency, circuit technique), though exception do occur. Differences in camera modules, storage size and supported memory card type are not crucial, as they might be embedded in any hardware platform. Up to now we have seen three editions of this platform, at that version operating system, Symbian, might shift as well, although it’s not a indispensable condition. The first edition based off Symbian OS v6.1, the second - Symbian OS v7.0s, the next one made use of Symbian OS v9.1. 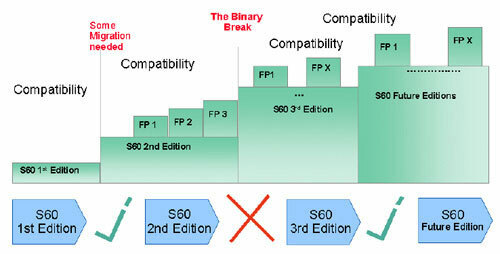 On top of that, each edition receives sets of extras, so-called Feature Packs (FP), which bring functionality enhancements with them, OS version may also be changed along with introduction of another FP – for example, the 2nd edition got empowered with three FP. More details are to come as we move towards the end. Before peaking in future trends of S60 development, we should pay attention to another sensitive issue encountered by users of Symbian-smartphones. As everyone knows not a single application written for devices powered by the 2nd and earlier editions is supported. As a matter of fact, it was new architecture going by the title of Application Binary Interface (ABI) for ARM that has led to the binary compatibility break This means that programs will need to be re-compiled using other set of tools. For the time being, it’s a real pain for some to switch from S60 2nd Edition-based devices, for example. The only thing we can find relief in, is the fact that nothing similar is going to take place when another edition shift (from the 3rd to the next ones) occurs, as they will be all round compatible. 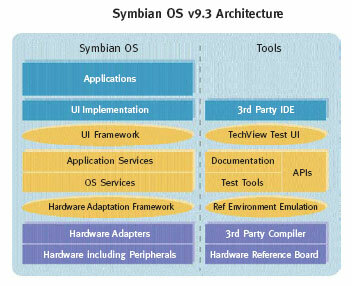 The 3rd edition runs on Symbian 9.1 operating system with completely re-worked kernel, EKA 2 (EPOC Kernel Architecture 2). The difference lies in the “real-time” support – this allows creating applications that rely mainly on execution time, for instance, VoIP. Developers will find it interesting to know about a new compiler used and improvements regarding security capabilities. In particular, the idea of certified applications is being brought in, which will have access to some APIs (about 40 APIs are now available, which allows developing any type of application). Now on to a more attention-grabbing aspect, namely hardware improvements recognized by the OS itself. These are support for WLAN (Wi-Fi), SD, miniSD, MicroSD cards and QWERTY-keyboards. Symbian OS Extensions – a set of tools, enabling the S60 to make use of features provided by the hardware, i.e. silent alert, battery status etc. Application Framework Services – provide basic capabilities for starting up applications and cervices, user interface components. UI Framework Services – shape outlook of interface components and events processing. Graphics Services – enable a device to process and then render it on the screen. Location Services – allow the platform to “track” current device’s location. Web-Based Services – feature tools for setting up connections, interaction with WEB-functionality, including browsing, files uploading. Multimedia Services – allows for playing back video and audio files, adds voice recognition system. S60 Application Services – a set of tools used by S60-based applications, that may engaged into development of third-party applications. The S60 defines the way of UI and APIs will look like, but at the same time has nothing to do with screen size (resolution) or data input system. Manufacturers are free to implement an own UI, while developers are to apply scaleable interface in their applications (for various resolutions). As an example we should mention one of the most interesting options delivered by feature pack 3 into S60 2nd Edition – support for scaleable UI (for display with resolution of 176 x 208, 240 x 320, and 352 x 416 pixels). For the time being only handsets running on the 2nd edition are supported, namely 6680, N72 etc. ; nevertheless soon enough, particularly in Sempteber, 3rd edition-based devices are getting own updates service. To the N90 owners’ dissatisfaction, this device won’t have any more updates in future. Enhanced interface customization for operators and licensees, updates over-the-air support. Optionally - Macromedia Flash Lite 2 by Adobe. Various configuration options allowing S60 licensees to create devices with low base price. Central Repository Notification Handler API. Advanced Multimedia Supplements (AMMS) API (JSR-234). Scalable Vector Graphics 2D API (JSR-226). Mobile 3D Graphics (M3G) API for J2ME™ v1.1 (JSR-184) (updated). The Bluetooth module embedded in Nokia-branded models deserves a special word. Chipset made by Murata Manufacturing (which is Nokia’s official supplier and the world’s second best Bluetooth modules manufacturer) is a top-notch piece of hardware for its class. However the devices carrying it onboard don’t feature support for many profiles and functions found on other models coming from the same niche – it has become clear that the only worthy limitation is the current OS version. The most of negative hype was generated by absence of A2DP (Advanced Audio Distribution Profile) profile, which quite obvious, as in this case there is no way to transfer sound to a wireless headset, earphones or car audio system via Bluetooth. Platform security – system defence mechanism based on granting and monitoring application capabilities. Infrastructure to allow applications to have private protected data stores. In addition, full encryption and certificate management, secure protocols (HTTPS, SSL and TLS) and WIM framework. 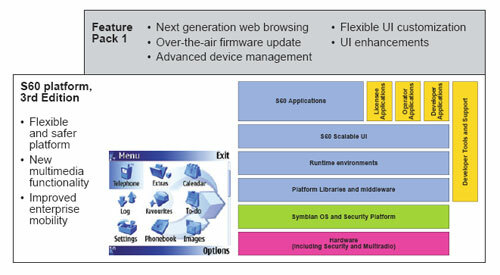 Flexible device creation with Symbian OS – allow flexible build configurations by choosing which key features of Symbian are desired. Better and simpler tools for testing included into Symbian Verification Suite. End-users will notice a speedup in start up of the system, memory management, switching between applications, etc. The thing I would really like to expose a feature that is to come with S60 3rd edition Feature Pack 1. Screens resolutions: starting from the FP1, the standard resolution of 176x208 pixels and the doubled one, 352х416 won’t be supported, while QVGA (320x240) grows spread at the moment. It has been made mainly in order to lighten the work for developers, who had to attune their apps to various ratios. In the near future we will see HVGA (320x480) and VGA (640х480) coming to replace the 352х416 pixels resolution, as these will power multimedia computers equipped with VGA screens, which will take over the top price-bracket, whereas QVGA-armed devices have already been downgraded to the middle-end of the smartphones market. Another valid argument for standardization is uncommon screens’ price – just come to think of this, why manufacturers actually need them, since the platform handles typical resolutions, incorporated by most makers of handsets, smartphones and communicators, in a convenient fashion? Being a very flexible platform, the S600 enables licensees to apply resolutions other than the abovementioned ones by making use of the bundled interface scaling feature. If we are to give you an example, Nokia 5500, which is quite unordinary due to featuring a resolution208x208 pixels, would be a good one. But in that case a manufacturer itself has to devote extra efforts to testing out devices. It would be reasonable to make an assumption that Nokia is probably trying to avoid making devices too bulky by developing non-standard resolutions and embedding them in handsets armed with tiny displays and compact dimensions accordingly. Apparently, we are going to see further progress in the field of small-sized screens for smartphones (the 5500 (30х30 mm), the E50 (30х40 mm)) in the immediate future, since Nokia is into miniaturization of smartphones and proven technologies of hi-end Nseries devices. Now, as regards the most crucial thing, namely hardware filling of S60-powered smartphones. 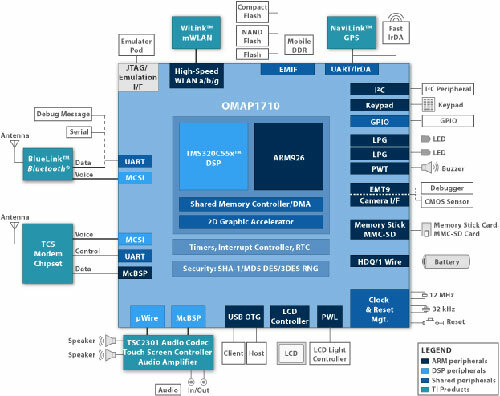 For quite a while Nokia’s smartphones have been running on Texas Instruments OMAP 1710, a single-core CPU, whose primary features are not to be ignored. 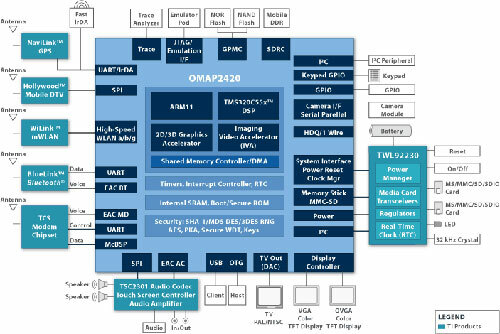 OMAP 1710 - Open Mobile Application Processor, whose ARM-kernel and DSP-kernel work at a frequency of 220MHz. The first of its kind, Nokia 6630 runs on a CPU powered by ARM926EJ-S core with ARMv5TEJ architecture, while the previous S60-based devices’ (FP1, Symbian 7.0s - 7610, 6670) core ARM925 has ARMv4T architecture. This chipset has been made use of for a long time in such devices as 6630, 6680, N70, N80, N73 and other N- and E-Series labeled smartphones. The operating frequency of 220Mhz doesn’t quake the earth in the eyes of the today’s users, however the OMAP 1710’s potential has not yet been unleashed, and despite of OMAP 2420, 2430 being already available, we will see exactly this cheapest implemented into a couple of upcoming models, as devices basing off the 1710 are quite speedy even for the present day. Increase in performance of new Symbian 9.1-based devices is a result of OS enhancements, rather than amplified hardware specifications. Back in April, 2006 Nokia announced the N93 that was destined to become milestone in the history of smartphones. Whether it’s so or not – we are about to figure it out. The spec sheet of the CPU powering this model (TI OMAP 2420) is quite impressive even nowadays – and what a breakthrough it was in 2004, when the N93 was still under development. Back then only the model 2420 was capable of delivering all required features of the device that was supposed to make it to the top owing to top-notch video recording capabilities. OMAP 2420 was announced in the year of 2004 and the Japanese manufacturer NTT DoCoMo was the world’s first company to introduce devices running on the 2420 (Panasonic P902i for example). OMAP 2420 retains all strengths of OMAP 2 architecture. The model makes use of ARM11 architecture, unlike the ARM9-based predecessors built on OMAP 1710. Chipset 2420 takes advantage of ARM1136JS-F (330MHz) CPU core, TI TMS320C55x™ Digital Signal Processor (DSP) (220MHz), and also of a 2D/3D MBX/VGP accelerator incorporated into the crystal. Improvements of multimedia capabilities have taken place due to addition of an accelerator dealing with image and video rendering, support for multi-megapixel (4+) camera modules, TV video output, recording and playing back MPEG4 videos captured in VGA resolution at 30 frames per second. Detailed specifications are available here. It appears quite interesting that OMAP 2420 CPU was picked up by Microsoft for implementation of platform with the abovementioned ARM1136 core for Windows CE 6, but it's quite another matter after all. Announcement of OMAP3 has given rise to various rumors and speculations about future device that will run on it. And it’s not a big surprise, as DVD-quality video recording, integrated ISP (image signal processor) for faster and better still image shooting, 3D-sound and 3D-graphics, provided by PowerVR MBX, and a number of other attractions are in the limelight. However at present there is not a single thing ensuring that Nokia would keep on embedding already tested in the N93 OMAP 2420 CPU in the future. A number of statements have made us feel uncertain about stability of the relationships between Nokia and TI – these include the one concerning cooperation between Intel, Nokia, Symbian (October, 2004), and a more interesting subsequent agreement with Freescale Semiconductor Inc initiating development of a device powered by a single-core Freescale MXC300-30 schedule for release in the second half of 2007. Seemingly, it’s too early to speak groundlessly about possible breaking up with TI – at any rate, Nokia is still the company’s key customer and new chipsets, like it happed with OMAP 2420, are intended for filling orders coming from Nokia. Platform MXC300-30 is built on ARM1136 CPU core (operating frequency 532MHz), DSP StarCore™ SC140e (250MHz), video accelerator and support for HSDPA are onboard, so that all in all, probable specifications of the devices will remind those of products based off TI’s solutions. 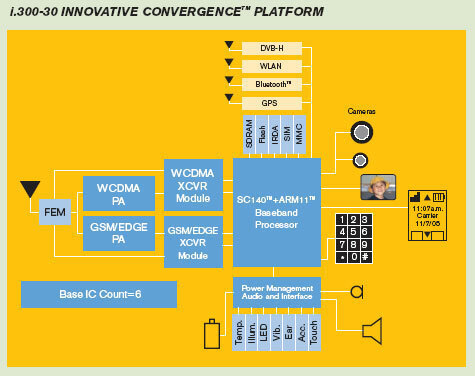 Also, i.300-30 running on ARM11 (400MHz) architecture, StarCore SC140 DSP (208 MHz) platform is of certain interest. It’s speculated that 3G-enabled devices basing off these platforms might cost even less than $150. The agreement would allow Freescale solutions to speed up development of smartphones aimed at the market’s middle-end. We are not going to take liberty to try and explain why these agreements are taking place, although we would rather make a supposition that appears to be close to the truth: the company plans to release a new line-up of Linux-based devices. While some might think it’s the least possible outcome, Nokia already has some experience of handling Linux on Nokia 770 in its portfolio, at that the competition on the market of smartphones is getting tougher – in the year of 2007 Motorola intends to announce a whole range of Linux-powered products, so that Freescale’s chipsets are going to be a force opposing to the Motorola’s solutions. Dimensions: We are going to see models become even smaller and also N- and E-Series devices bearing 5x and 6x indexes on them, which will turn out to be simplified, yet more compact prototypes of what we experience with N8x and N9x series. Particularly, everything we consider to be top price-bracket only technologies and aimed mainly at techi today, soon will be retained by middle-end models. Displays: QVGA is going to hold the upper hand over all other solutions for the time being, even in light of the platform supporting bigger resolutions (HVGA, VGA) – these are to remain privilege of the top price-bracket and E-Series E8x, E9x communicators, for example. Functionality: 3D accelerators will start getting embedded in more models, including those with gaming capabilities as their main aim (the first of a kind is the N93); this year will see arrival of a 5 Mpix camera module incorporated into a mobile device, which is to be announced on the 26-28th of September – it’s not a big surprise that this phone is the double-slider N95, whose photos were published a while ago. Hard drives won’t be left out in Nokia’s S60-based devices either – particularly, the successor to the N91 is to be presented simultaneously with the N95 and will boast 10Gb of storage space. Another thing of note is the agreement with Samsung Electronics on expansion of NAND memory chipsets supplies, which will allow releasing models showing off from 1 to 8 Gb of memory on board beginning from summer 2007. Furthermore, Samsung is planning on launching production of 8Gb chipsets by the end of this year and naturally it is not the utmost limit – 16Gb flash-chips will become available already in 2007, and in case the cooperation with Nokia goes on, the devices manufactured by the latter company in 2007-2008 will be able to sport considerable storage space. Although HDD-powered solutions are going to stay in the company’s range, NAND memory will be its main focus. 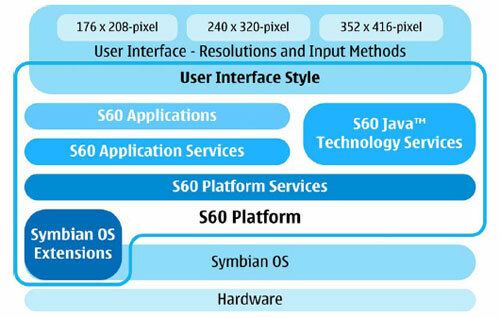 On the whole the future of S60 platform appears to be quite optimistic – in the 3rd quarter of 2005 S60-based devices occupied 58% of the smartphones market, consequentially further upgrades of Symbian-smartphones’ hardware, enhancement of default applications for the devices and downsizing will do the job and bring the platform to the next level of popularity. However, as we have already mentioned it, the competition is tough today and is to continue heating up in future. Some analysts forecast prevalence of Linux OS and Windows OS over Symbian OS by the year of 2010. Generally, these are individual manufacturers that push forwards one or another operating system. Upcoming devices by Motorola (and solutions for the Chinese market as well) seemingly have what it takes: speedy interface, low power consumption etc., but at the same time their kernel will be closed for end-users. Products running on Windows Mobile 5.0 will get slightly shapechanged in terms of the fundamental concept and acquire some really outstanding features for their connectivity and support for HSDPA, AKU-3. The UIQ platform is not wide-spread at the moment, so everything is up to the market’s players applying that solution. Sony Ericsson is the world’s biggest supplier of UIQ-based devices, and owing to the company’s efforts, soon we might see expansion of the UIQ-market due to them being positioned in a number of segments at once without smartphone-only features getting much of focus. Examples of such policy are available even nowadays - these are the M600i and the W950i.